Office space prices ranging from Rs25600 - Rs29500 per month. This business centre is situated in the main city centre, close to important facilities. This is a state-of-the-art facility offers meeting rooms and serviced offices with a full range of amenities including high-speed internet connection, around-the-clock security, and a main reception. Spread over four floors and a basement, this centre provides a corporate environment which is perfect for companies seeking plug-and-play facilities. This modern business centre offers clients both private serviced offices and co-working solutions. 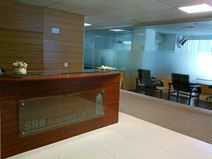 The space incorporates excellent in-house facilities alongside a strategic, central Rawalpindi location. Shaheed-e-Millat Station South and 7th Avenue Metro Station are both within easy walking distance of the space and the centre is surrounded by a diverse range of restaurants, cafes and retail outlets. This modern business center offers clients both private serviced offices and co-working solutions. The space incorporates excellent in-house facilities alongside a strategic, central Rawalpindi location. Shaheed-e-Millat Station South and 7th Avenue Metro Station are both within easy walking distance of the space and the center is surrounded by a diverse range of restaurants, cafes and retail outlets. This center is a watering hole for different industries to come together, network and share alternative and new ideas. Conveniently located in Pakistan's capital, Islamabad, in the heart of the commercial hub, this centre is well connected to Kashmir Highway as well as a wide range of amenities such as the post office, restaurants and eateries, 5-star hotels and other international businesses. Businesses will benefit from 24-hour access, IT support, break out and lounge spaces, meeting rooms and state-of-the-art telecommunication technology.